Judy Blume. Photo courtesy of Elena Seibert/Knopf. 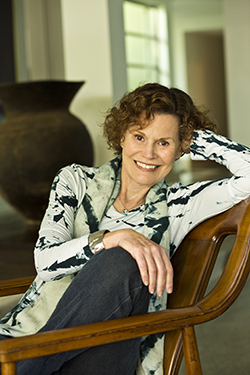 Judy Blume knows that for millions of readers worldwide she represents childhood. Since her first book was published in 1969, her characters—from Fudge and the Pain to Margaret and Sally J.—have accompanied children as they compete with their siblings, worry about bullies, face death and loss, explore their bodies and identities and trek through the angst of puberty and adolescence. Blume’s ability to translate childhood empathy onto the page, to articulate with directness and compassion just how her readers are feeling and thinking, has earned her a loyal fan base and numerous honors, among them the Margaret A. Edwards Award for lifetime achievement from the American Library Association; a Living Legend Award from the Library of Congress; and the Medal for Distinguished Contribution to American Letters from the National Book Foundation. Blume’s 29 books have sold over 85 million copies and have been translated into 32 languages. The best stories, says Blume, come from someplace deep inside. Now 77, she spent five years writing her new novel—her fourth for adults—based on a tragedy she herself lived through when she was a teenager growing up in Elizabeth, New Jersey. In the Unlikely Event (Knopf) tells the story through multiple perspectives of the intertwined families who are shaken with horror when three planes crash into their town over the course of two months between 1951 and 1952, killing 118 people. “I always knew it happened. Why I never wrote about it—having a story like that—why wouldn’t I tell it? I have no answer to that,” says Blume, who lives and works most of the year in Key West, but is at her New York apartment for a few days in the midst of a demanding publicity tour. She points to the round table in front of a picture window overlooking Central Park West, noting that she replaced it with a long table that turned the space into a newsroom while she was working on revisions. Her husband of 35 years, retired law professor and nonfiction writer George Cooper, simultaneously combined and revised the real news stories of the time. The stories appear in the novel under the byline of one of the main characters, journalist Henry Ammerman. Blume had not been planning to write another adult novel but the story came to her almost overnight at a literary seminar. She researched the story for five months before beginning to write. Though her father, a dentist, made multiple visits to the morgue to identify bodies from the three crashes, “not a word was ever spoken at home. No teacher ever mentioned it. I was supposed to be O.K. I was supposed to be happy, so that’s what I tried to be,” says Blume, adding that she was “an anxious kid with a lot of imagination,” but she doesn’t remember being scared. Blume’s books create a safe space for readers, showing them that they are not alone as they explore the facts, fears and fantasies of growing up. Her adult novels—Wifey, Smart Women and Summer Sisters—were also best sellers, focusing on fulfillment, marriage, divorce, relationships and friendships among women. Blume also threads Jewish themes into her books: In Starring Sally J. Freedman as Herself, Sally imagines that Hitler has relocated to Miami and is posing as an elderly Jewish neighbor; Are You There God? It’s Me, Margaret explores the search for religion (Margaret’s father is Jewish; her mother is Christian). Even when Judaism is not overt, the unassuming way Blume presents the Jewish identities of many of her characters is a welcome surprise for Jewish readers, many of whom articulate their appreciation to Blume. “They enjoy finding books that are not about Jews in the Holocaust or other hard times, but focus instead on characters who are like themselves and about families that sound like their own,” says Blume. “When I first read Are You There God? It’s Me, Margaret, right before seventh grade, I was pretty sure that every understanding and in-tune word had been written just for me. It’s a rarity still for me to feel like a book ‘gets it,’ gets me, the way I felt at 12,” writes author Alison Pace in Everything I Needed to Know About Being a Girl I Learned from Judy Blume (Gallery Books), an anthology edited by Jennifer O’Connell. Horowitz remembers her own daughter discovering, at age 4, that Nate the Great is Jewish: “She said, ‘In this book [Nate the Great and the Crunchy Christmas], he tells his friend he’s eating a potato pancake because it’s Hanukka, and that’s his holiday.’ It was just in the story; it’s told in passing. Kids can see themselves and not be singled out or left out.” Horowitz also points to the respectful family and generational connections in many books, including In the Unlikely Event. “Culturally and spiritually I’m a Jewish girl from New Jersey,” says Blume. She shares a few Hadassah tidbits: Her mother belonged to Hadassah; she herself is a Hadassah life member; she named her first doll Hadassah after the beautiful daughter of a rabbi, both patients of her father; and Cooper’s aunt by marriage was related to Henrietta Szold. In gray capris and a t-shirt that says “Born to Love,” her face bare of any makeup and framed by short, wavy brown hair, Blume talks openly about her life with a forthrightness that matches her writing, which, she says, was a way to work through her own pain and anxiety. Her childhood was studded with loss. Her father, Rudolph Sussman, was the youngest of seven; all seven of them died before age 60. When she was 10 her grandmother and aunt died. Blume’s mother, a homemaker who went to work as a legal secretary when she was widowed, encouraged her daughter to pursue a traditional path. Blume graduated from New York University with a degree in education and was soon taking care of two children: daughter Randy (a commercial airline pilot turned clinical social worker) and Lawrence (a filmmaker who directed the movie version of Blume’s novel Tiger Eyes). Blume’s brother is a retired Air Force lieutenant colonel and runs a private recycling business. Blume divorced in 1975, married a physicist and moved to Los Alamos, New Mexico, and divorced again before marrying Cooper, who has a daughter, Amanda, from a previous marriage. They have one grandchild, Randy’s son. A curious child who loved to read—the Betsy-Tacy series by Maud Hart Lovelace was her favorite—Blume says she was always making up stories in her head but never thought about becoming a writer. Her early efforts at writing, when her children were in nursery school, earned her two years of rejection slips before Reilly and Lee accepted her picture book, The One in the Middle Is the Green Kangaroo. She wrote Iggie’s House in a class at New York University and submitted it to Bradbury, where publisher Richard Jackson discovered it in the slush pile. Beginning with Margaret, her third book, she mined her own background for plot, setting and character. Blume seamlessly meshes Margaret’s poignant conversations with God (“I’ve been looking for you, God. I looked in temple. I looked in church…. But you weren’t there…. Why, God? Why do I only feel you when I’m alone?”) alongside her visceral longing for her physical development (“We must—we must—we must increase our bust,” she and her friends chant together). Margaret was removed from some school libraries in the 1980s because of its groundbreaking honesty. Since then, Blume has worked tirelessly with the National Coalition Against Censorship to protect the freedom to read. She also established the KIDS Fund to develop programs that encourage communication between parents and teens. She’s in a different place now, she says, than she was when she wrote her early books: “I like complicated storytelling and I made my name on the opposite.” She is not sure how she will channel her creative energy next, but in the meantime she loves being outdoors (her desk in Key West faces her garden) and savors her hobbies: reading for pleasure; walking two fast miles a day; riding her bike, enjoying movies and the theater, and tap-dancing when she can (she learned at age 45). I was an elementary school teacher for 34 years. During this time I did Judy Blume author studies. The students associated with Blume’s,characters whether they were in kindergarten or the sixth grade. As an adult, I too enjoyed Blume’s children’s books, for they recalled long forgotten memories and emotions. Thank you, Judy Blum for all you have given to many generations of children.